'My other piece of advice, Copperfield,' said Mr. Micawber, 'you know. Annual income twenty pounds, annual expenditure nineteen nineteen and six, result happiness. Annual income twenty pounds, annual expenditure twenty pounds ought and six, result misery. The blossom is blighted, the leaf is withered, the god of day goes down upon the dreary scene, and - and in short you are for ever floored. As I am!'. In this case consider that our expenses, i.e. 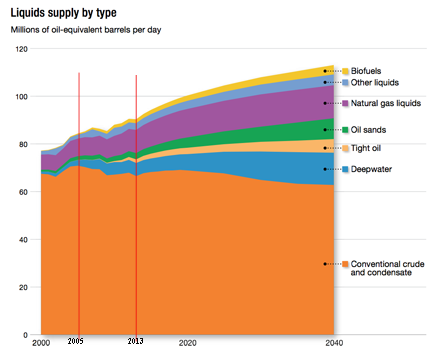 the world use of oil, went up last year to around 83 million barrels every day (mbd). (A barrel is 42 gallons). Now as long as our supplies (income) can match this outlay then we are in happiness. This was, in relative terms, where we ended last year. However this year our expenses are going to go up. It is a little difficult to predict exactly how much but current predictions are for this to be around 2 mbd. Let us equate this to the old English sixpence (which was back then worth about a dime. Twenty pounds being worth about $100). If we follow the Micawber example if our income, world oil supply is equal to or greater than our expenses then we can stay happy. But here is the rub. When world oil production is just about as high as it can be (non-OPEC countries are now producing just about as fast as they can) and OPEC spare capacity is down to around an additional 1.3 mbd. then our income this year will likely not be much above 85 mbd, if it gets there. (In a later post I will explain why it probably won't). • and Russian production declined more drastically than had been anticipated. Some of these are still with us, some have been resolved. And other problems, such as the complete employment of the world tanker fleet, have yet to make an impact. But any one can drop supply. Yet while our supply (income) is about at a peak (twenty pounds), our expenses (demand) are still going up by this sixpence a year. So that some time this year expenses will have gone from twenty pounds to twenty pounds and sixpence. A number of economists had been predicting that there would be a reduction in the rise in demand to keep us below that figure, but it is already clear that they do not adequately recognize the considerable needs in China and India that drive this increase (and they only have to read the papers to see it). The big question is when will we reach the point that we cross over the balance point. Right now with the Saudi Arabian government saying that they can increase production by up to 1.5 mbd one might think we could get through to just about the end of this year. Unfortunately some of us are a little cynical about that number, and I'll explain why in another post. One final gloomy thought - production in other countries (such as the UK) is falling, and the countries that used that supply must find another source. And if we are now at the peak of production, then our income cannot increase above twenty pounds and and may indeed fall back below twenty pounds, while our expenses will continue to increase to twenty pounds and sixpence. It is not the absolute size of the market that will now drive, but the relatively small fluctuations that take us out of balance. The result is misery, and we are for ever floored. Looking around it is reasonable to note that we don’t see the level of misery that, from reading that post, one might have expected to happen. We have gone through a major recession, yet demand has, overall, increased and production has risen to meet that demand. Yet looking at how this has been met is instructive. I have added lines to show the situation in 2005, when the piece was written, and for this year. It is worth noting that, using the definitions that Exxon Mobil give, conventional crude and condensate production has, indeed, declined since I wrote those words. And if one includes Oil Sand and Deepwater then production has remained fairly stable at the levels back in 2005, and will (according to EM) likely stay so into the projected future. The three sources that I had underestimated, in terms of production growth were in Biofuels (which is now at around 2 mbd), the growth in Natural Gas Liquids (which for OPEC alone is now projected to reach 6 mbd by next year up from around 3 mbd in 2005, and the growth in tight oil. This latter development, particularly with the use of long horizontal wells that are artificially fractured and injected with a slick-water suspension of a proppant, has been very successful in developing resources which were otherwise at best marginally economic. However the relative contribution that this is expected to make in overall supply is not that great, and I expect that, because of the high decline rates in individual wells, that this will only contribute on the margin of the problem. When I began writing at The Oil Drum I was concerned that there was a lack of understanding of the impact that reservoir decline rates would have on long-term supply. As larger fields are depleted, so the world turns to smaller fields and these drain more rapidly, so that more and more are needed. (The Red Queen situation that Rune Likvern and others have so aptly described. Deepwater resources have proven to be more difficult to bring on line than originally estimated and thus, for example, in the case of Brazil OPEC now anticipates that the production from the Lula field (originally Tupi) will only offset declines from wells in the rest of the country, with perhaps only a gain of 10 kbd overall from the addition of the 100 kbd expected from wells now coming on line. And thus, while this is a resource getting more attention (there are expected to be 60 Deepwater rigs in the Gulf of Mexico by 2015) the slow pace of development may not fill the increasing gap left as conventional oil production continues to fall, as Exxon Mobil suggest. In retrospect, therefore, I was wrong in anticipating a relatively immediate impact from an anticipated imbalance between oil supply and demand. But, within the time frame the price of oil has risen, and the future looks no happier than it did back in 2005. The threats have changed – we seem to be in a quiescent period for major Gulf Hurricanes, for e.g. – but the threat of growing and spreading turmoil in MENA makes it less certain that we can count on much increase in production from Iraq, among others. Russian production rebounded more than I expected, but whether that can be sustained is still in doubt. The hope, at the beginning, was that the threat would spur increased looks into alternate sources of liquid fuel. But while there was a flurry of activity into biofuels (and I myself saw algal work that held a great potential, - though funding has now disappeared for that effort) there is less of a feeling of urgency in the air. Wind and solar sources have reached a point where they are no longer novel, and there is not much else in the near term that holds much potential. When these posts began, technical blogs, such as TOD, posed the potential for mass education in a way that had not been seen before. Readers have been kind in regard to the quality of the posts themselves. But the contributions from those interested, and those in industry who took the time to comment and debate ended up making this much stronger than the initial words in any post. Expertise came in many forms and informed me as well as the rest of the readers in what turned into a wonderful opportunity for many people to understand some of the complexities of supplying the world with hydrocarbon energy. I was thus able to help bring a little understanding of the energy business to vastly more folk than I had in the entirety of my academic career. I will always be grateful to Kyle for giving me the opportunity to make this contribution, and to his efforts which led to its great success. I can illustrate that with some numbers – as an academic I took persuasion to allow my class size to rise much above 20, and at Bit Tooth Energy I see about 300 readers on a typical good day – Kyle had us above that number in a very few months, and at its peak TOD was handling 200 times that number. The site would not have continued too long as it grew in size without the indefatigable SuperG, who kept the site up under wide ranging pressures, and took care of the technical side of the house. Leanan brought and kept us readers, and provided many of the topics that we needed to create the posts on site, and Gail kept me going with encouragement and support in more difficult times. Nate orchestrated the closing posts and that was not easy. (Heading Out – Dave Summers in the mundane world – will continue to write Tech Talks at Bit Tooth Energy, though he writes on a wider range of topics at that site). Thanks for all those Tec talks. I hope that I for one am better educated than I was. And I am glad you point up Red Queen and geopolitics and 'slow' Deep Water. Brazil looks like a test case, no? It always was about 'rate' not 'reserves' if I have learned correctly. Thanks for the comment and the kind words. I used the EM plot just because it highlighted the two sources that I was "in error" over, namely the biofuels and NGLs, and it was the first I found that showed this.